Do you have any physical impairment and have had a diagnosis of cancer, currently in remission or six months beyond treatment? Are you an adult living anywhere in the UK? If the answer is yes, please take a moment to consider participating in an interview study funded by Tenovus Cancer Care. The aim of the Challenges of Cancer and Disability Study, CoCaDS, is to improve cancer care for disabled people. It is carried out by researchers at the School of Healthcare Sciences, Cardiff University. 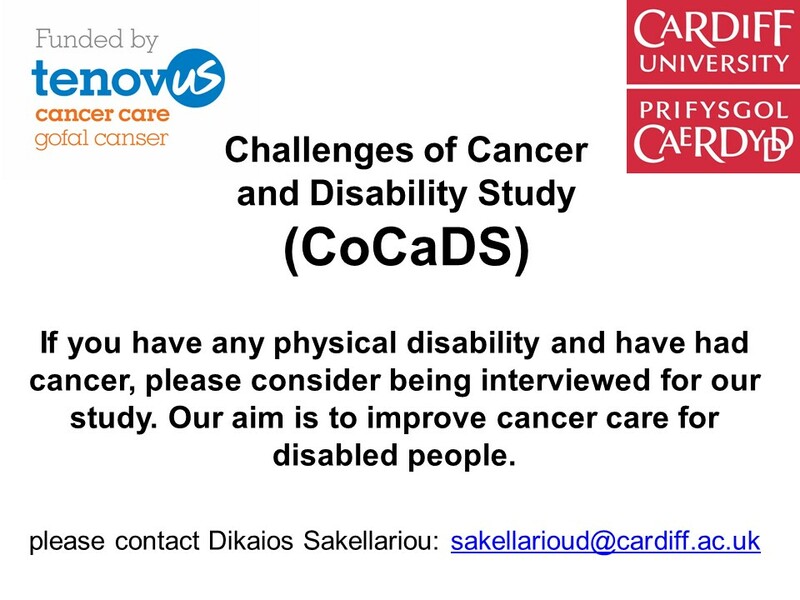 If you are interested, please contact Dikaios Sakellariou at sakellarioud@cardiff.ac.uk or 07511554462 (text or voice).